As a biomedical engineer, a Paralympian, and cancer patient, Cassie Mitchell touches many lives at Winship and Emory. As a biomedical engineer, a Paralympian, and cancer patient, Cassie Mitchell touches many lives at Winship and Emory. 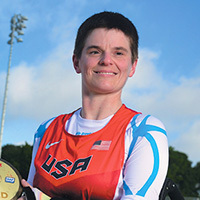 Diagnosed with chronic myeloid leukemia (CML) in the spring of 2016 and laid low by severe side effects from chemotherapy, Mitchell nevertheless qualified for the 2016 USA Paralympic team. Still undergoing treatment, she competed in Rio De Janeiro and came home with a silver medal in the discus throw and a bronze in the club throw. Her doctor, Winship hematologist Vamsi Kota, MD, supported her throughout. "She has been an inspiration to her entire healthcare team," says Kota. "I've never met anyone with her level of determination." 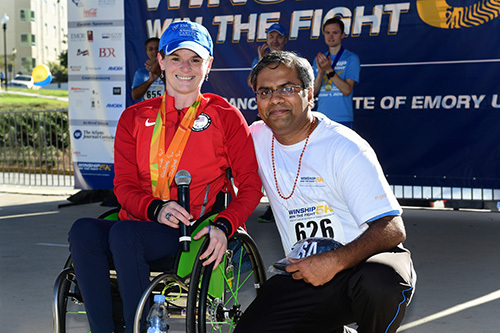 Mitchell reached out to the larger Winship community by appearing at the 2016 Winship Win the Fight 5K, where she handed out medals and thanked Dr. Kota with the gift of her official USA Olympic cap. Mitchell's lower body and eyesight impairments are caused by neuromyelitis optica, an autoimmune disease of the central nervous system that began affecting her at age 18. She persevered in both academics and athletics, receiving her doctoral degree from the Coulter Department of Biomedical Engineering at Georgia Tech and Emory. She is now a research faculty member in the department. Cassie with Dr. Vamsi Kota at the 2016 Winship Win the Fight 5K.